Since joining the Gullah Gone team in fall 2016, Sherard Duvall has become vital to the progress of the film as producer and editor. He supervises the physical aspects of filmmaking including personnel, project workflow, and scheduling. During filming in St. Helena, Duvall makes sure everything runs smoothly on location. As editor, he created the trailer released on July 20, 2017, and he is building the rough cut for the full-length film. He has experience as producer and editor on both a national stage and locally; currently working as owner and executive producer of OTR Films based in Columbia, S.C.
Duvall’s professional experience make him a valuable asset. He has produced projects for VH1, Discovery Channel, MTV, BET, and the American Cancer Society. He is accomplished in the art of visual storytelling with a strong background in media literacy and marketing communication. He holds a degree from the University of South Carolina in Media Arts. As a USC alumni and Columbia native, Duvall is no stranger to the unique culture and resources of South Carolina. 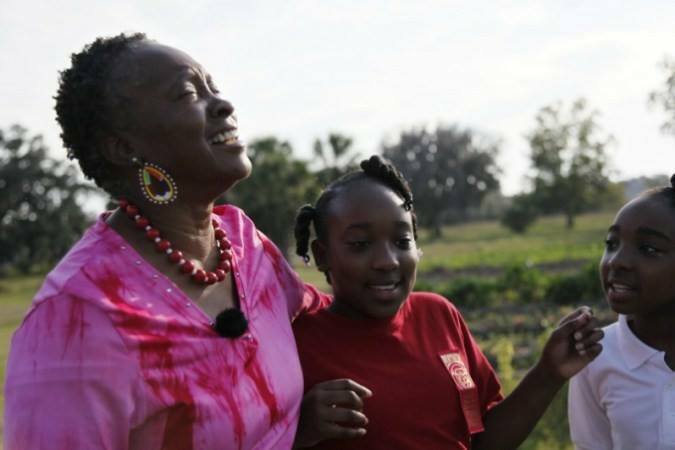 GG: How did you first become aware of The Gullah Project? When did you become involved? SD: I became aware of The Gullah Project in October of 2016. I think it was a buddy of mine, Amy Shumaker of SCETV, that first gave me the heads up that she suggested my name for a project and that a Denise McGill would be reaching out to me. In October, Denise and I met and she discussed the project with me in her office. If I remember correctly, I agreed to be a part of the project on our first meeting. GG: What drew you to the project? What does it mean to you? SD: Unbeknownst to Denise at the time of our meeting, I had made a conscious decision in the spring of 2016 to make all of the work that I do focus on minorities, particularly those of the African Diaspora, that experimented with new ways of seeing the human experience. At about the same time I began a personal journey to find my family’s roots and my own genetic connections to West Africa. That was my mindset when I walked into the meeting with Denise in October. That summer of 2016, I began getting all of these projects out of the clear blue sky that fit exactly what I wanted to do, The Gullah Project was one of them. I felt that it was meant to be, honestly. This project defines freedom for me, that’s what it means to me. As a native South Carolinian and African-American, I understood the importance of that word, because it’s a word, that I feel, descendants of African slaves like me will never know the true meaning of. The descendants don’t really have a home. True freedom, is not just the opportunity to roam, but its the license to live life within your truth. Part of your truth is knowing who and what you are. That’s a void American slave descendants can never fill. That’s what I feel like these residents of St. Helena are fighting for…freedom. The freedom to have a place that is all yours, that is actually connected, through language AND culture, to the history of who and what you are. GG: Why do you think Gullah Gone should be made? SD: I think Gullah Gone should be made because of how important the story of freedom is to America. It continues in that same vein of survival stories of American Freedom. The Gullah Story is vitally important to the fabric of America because of how it defines who the African-American person IS. St. Helena island is living history, an actual place where thousand year old West African traditions and language are being passed down to African slave descendants, a world away from Africa, in 2017. It’s unbelievable. GG: How did you come to start OTR? SD: OTR was a dream back in 2012 when I was senior producer at Genesis Studios. I have to credit FatRat Da Czar, OTR’s co-founder, for encouraging me to open a company where I could produce projects where I controlled the creativity. Back then it was just film, but today I make movies, teach media literacy, and help companies with their branding strategies. GG: Tell me about your day to day with OTR. How will those experiences influence your workwith Gullah Gone? SD: That’s tough to define. As an entrepreneur running a company that really operates in three different worlds, my day to day life varies. One day I could be designing a film education program for a school and the next I could be on set with The Gullah Project or in a meeting to create a messaging campaign or brand for a client. At the end of the day, all we do is help others communicate messages effectively – that is the mindset and the influence that I bring to TGP. GG: Do you have a favorite experience working with the project so far? SD: I have so many!! But if I had to pick one, it has to be the first time I met Sara’ Reynolds Green at her home. As the sun was going down, she was showing us around her farm and her home in these leopard print galoshes, blue jeans and a long sleeved tee. The sun was just setting and I remember she told us about the land and how her mother used to work the land. Denise and I walked through her farm and marsh…and then, Sara stood erect, and just looked out over the land…saying a little prayer to God under her breath. In that moment, I got it. I understood what she was fighting to hold on to. I began to understand the importance of the land I was walking on, and the importance of this story to people like me. That idea of having a home and a land that is yours — passed down by your own family who were slaves, who passed down their African traditions to you — and to stand there in the presence of that. It was very moving. That is by far my favorite experience. I remember I went back to my room that night and wrote about that one.